Felcon Limited is a manufacturing company with over 25 years experience specialising in the design and manufacture of stainless steel and polypropylene equipment, the range of equipment including laminar flow clean air, chemical processing and bespoke handling equipment for the microelectronics, pharmaceutical and other specialist industries. Goldsworth Medical are specialist suppliers and consultants for sterile services and endoscopy departments within hospitals and the pharmaceutical industry. Equipment manufactured includes; height adjustable sinks and tables, conveyors, transfer hatches, autoclave and washing machine loading trolleys in accordance with GMP. Customers include individual NHS trusts, private hospital groups and OEM equipment manufacturers of autoclave and washing machines. Established in 1962 Goldsworth offers a comprehensive design and manufacturing service for specialist engineered equipment with a bias towards the hospital, sterile services, endoscopy departments, pharmaceutical and allied industries. 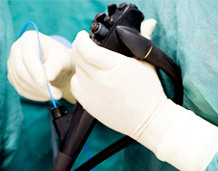 The company has gained a highly regarded reputation as a quality independent consultant, designer and manufacturer of equipment to suit all aspects of both hospital sterile services and endoscopy department's work. 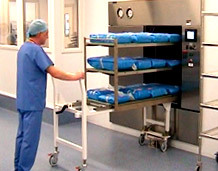 This includes equipment for handling such as conveyors and trolleys, equipment to facilitate transfer between departments whilst maintaining room integrity (ie transfer hatches and airlocks) and finally bespoke equipment to complement washing and sterilisation systems (ie height adjustable sinks, trolleys and tables). Designed and patented by Goldsworth the 'Easyload' trolley system for Autoclave loading / unloading, offers the operator added protection by removing the potential dangers associated with processing hot, heavy loads. All our 'Easyload' equipment fully utilises chamber capacity and can be adjusted easily. Our expertise, coupled with an understanding of our customers' requirements, have been applied to a vast range of purpose made equipment from simple containers to environmentally controlled transfer chambers. There are very few projects within our field we are not confident to undertake on our customers' behalf. In 1999 the original Goldsworth Engineering Limited was purchased by the Felcon Group of companies, who changed the trading name to Goldsworth Medical Limited and moved its operation to Newhaven on the South Coast, sharing the specialised manufacturing and design facilities with Felcon Limited, thus providing a complementary range of quality bespoke products to the medical, pharmaceutical and micro-electronics industries. 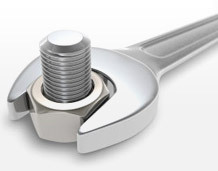 All products are designed to reduce manual handling, increase accountability and generally assist in the efficiency and safety of sterile service departments.